When you make some kinds of soup, it is tastier to use meat or vegetible stock instead of just water. 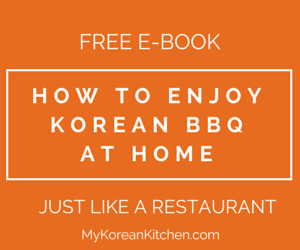 To make this stock, Koreans often use anchovy (멸치) or kelp (다시마). However anchovy is quite expensive and it can be a bit hassle to use (trimming the head, tail and organ etc), so I sometimes use powdered anchovy instead. Hi. When I use the powder there is a lot of residue in the soup. Even when I strain it.. is this ok? That should be OK. By the way, what did you use as a strainer? A coffee filter paper might work better than a metal strainer. How do you use it? 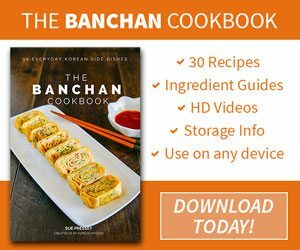 Water to powder ratio to make a broth? You basically dissolve the powder in boiling water (like making a tea). Ratio is based on your preference, but roughly 1 Tbsp to 1 L water. Hope this helps! Yes thank you! Been wanting to make fish cake soup but since I didn’t know how to make the broth ratio with the powder I kind of have to wait. I can’t wait to make the soup! I want to purchase anchovy powder in the bottle. Do you sell it? Hi Steve, I don’t sell anchovy powder. 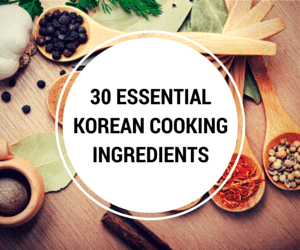 Is it to make Korean soup stock? I just looked up on Amazon and they do have it – http://amzn.to/1Kp9RCM – Though this one is 1 kg! That’s a lot. It will take a few years to go through unless you make soup every day. 🙂 Alternatively, you can use this one. http://amzn.to/1jUB5Mp This is not powdered. Though I do use tea bag anchovy soup base at home a lot. FYI I haven’t tried these two brands I linked here. 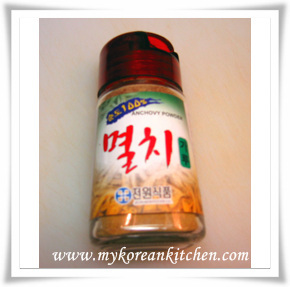 what is the korean name of anchovy powder? We can get the anchovies powder from shop in Penang, Malaysia for quite reasonable price. It cost only USD2 for a bottle of pure anchovies powder with 120g net weight. I went to the shop last week and they even offer me to be their distributor in Korea if possible. If any one of you interested to become the distributor in Korea or any country, you can contact the shop owner at +60125413988. It’s called Myeolchi Garu (멸치가루) in Korean.